The fine lines of beads dance a dizzy helix as they make their way up the glass. Under the raft of rich brioche aroma from the lees contact this lovely cold climate sparkling carries the flavours of berries, blackcurrant and earthy raspberries with a lovely, lasting savoury finish. A beautiful wine that cries out for a marriage with food. With a subtle blush of pink Crofters Fold blanc de noirs speaks volumes about the way the fruit were grown. Tight little bunches of pinot noir grapes grown on the north east facing slopes on the border of the granite and basalt country at the edge of the Cobaw Ranges near Kyneton. No pesticides, mostly rain watered and hand-picked. There’s not much of Crofter’s Fold blanc de noirs. Just 500 bottles. The vineyard is tiny. Last year’s vintage has already been allocated. In fact, the only way you are going to be able to taste some is by ordering it at Annie Smither’s Du Fermier in Trentham or by placing an expression of interest for the 2018 vintage on the website. Crofter’s Fold is a micro farm. Just 12ha there is just a quarter hectare under vines and another dedicated to aromatic roses and peony roses. “We want to be small,” says Ashley Wren. “We want to farm on a human scale,” adds Danielle Wren. The husband and wife team took over the historic farm, neglected vineyard and old sheds and rustic buildings, back in 2012. Proponents of the micro farming movement they set about rejuvenating the vineyard and planting out a protected site with roses. “A couple can make a living from just a few acres,” says Danielle as she picks her roses. They are hybrid tea roses and carry names like Addictive Lure and Perfume Passion. They are wonderfully scented and like the wine have notes that recollect memories of other scents. 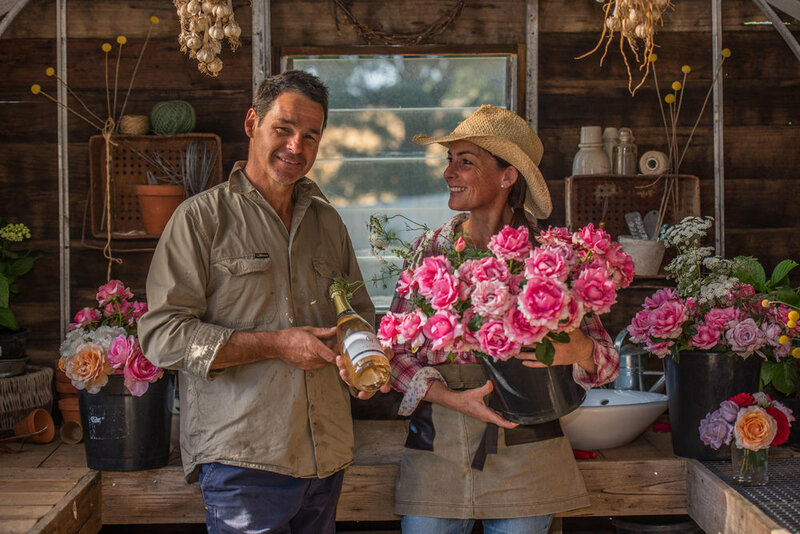 “The supermarket roses are often grown in countries like Kenya and Brazil,” says Danielle. “They are sprayed with pesticides and preservatives and look beautiful,” adds Ashley. “But they have no aroma. None at all,” says Danielle.